Great bike pump for the price! Very good value, works extremely well, sits on the presta valve very easily. The valve is incredible. Only complaint is no bleed option. The pressure seems to be dead on as well. Solid pump for the price. Little tricky first time setting proper valve but great after. I use it to pump up my bike tires, silly! The older Joe's air chuck wasn't the best. The new one, at least after one year, is near-perfect. It's easy to use and secure. The gauge has a useful range and size, and the position makes it easy to see. No reason to spend more for a pump. This one really is excellent in every way. Chuck started leaking after a year of use. Never did like the short hose. Will replace with another brand. Bought two of these floor pumps, one for my home and one for my grandkids on Cape Cod. Well engineered, well built and efficient to use on either valve stem, plus inflation nozzle and needle for balls and toys. Very pleased. 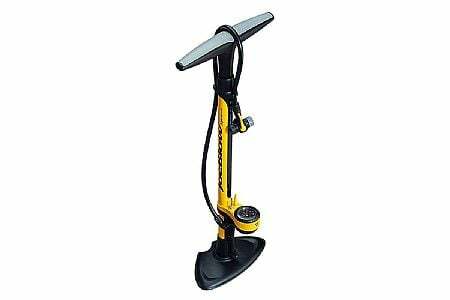 I purchased this pump because i know that Joe Blow pumps are highly recomended at most bike shops for a great low costing bike pump. I do like the fact that is can do the standard schrader valves, and the presta valves without changing any parts, or using any adapters. This pump also comes with a ball inflator, and a air bed inflator as two extra pieces that come with it. I highly recomend this pump, because of the ease of using it. Money well spent for such a great product.